The Missouri Rice Council is an organization organized by and for Missouri rice farmers. We share a common goal of promoting rice through superior farming practices, extensive research and ongoing farm conservation efforts. Rice is more than just food on the table. 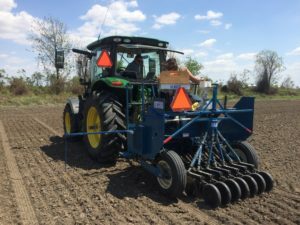 Rice is a lifestyle for many southeast Missouri farmers. We work hard to provide not only our area but the world with high quality rice, and give our all to ensure that when someone says, “Rice from Missouri,” they know it’s the best around. Through education efforts, university research and in-practice study, the Missouri Rice Council continues to work to ensure that legacy of quality and performance. George Begley Jr first grew rice near Dudley MO in Stoddard County in 1910. Missouri rice production began in earnest in the 1960’s. By the 1980’s rice production increased to 80,000 to 100,000 acres. Currently, Missouri rice acres center at 160,000 to 200,000+ acres depending on weather and market influences. Missouri rice production is completely located in southeastern Missouri, with the Arkansas boarding counties of Butler, Dunklin and Pemiscot having the greatest acreages. The total 2015 value of Missouri rice production is $185,000,000. On 3 October 1984 the articles of incorporation for the Missouri Rice Research and Merchandising Council (MRRMC) were filed and signed by Mr. David Minton (Dexter, MO), Mr. Larry Riley (Bernie, MO) and Mr. M.O. “Sonny” Martin (Bernie, MO). The first MRRMC board of directors consisted of the three signers of the articles of incorporation and Mr. Danny Sentell (Qulin, MO), Mr. Bill Turner (Qulin, MO), Mr. Bruce Yarbro (Poplar Bluff, MO), Mr. George Norwood (Poplar Bluff, MO), Mr. Jack Vancil (Campbell, MO), Mr. Fred Tanner (Bernie, MO), Mr. Mike Armour (Naylor, MO), and Mr. Bill Buck (Wardell, MO). Almost immediately, the MRRMC started discussing the possibility of a research farm dedicated to producer desired and producer directed research and marketing. The Missouri Rice Research Farm was established in the mid-1980’s with the acquisition of 30 acres plus ten leased acres. New MRRMC members included Mr. B.J. Campbell, Mr. Richard Burnett, Mr. Andy Clark and Mr. Gary Murphy. Subsequently the Farm Research Farm acquired an additional 75 acres and the entire complex was land graded and established for flood irrigation. A machine complex and office was installed, as were the access roads, communications and field machinery. Dr. Paul Tracy (University Missouri agronomist) was the first farm manager. Dr. Donn Beighley was the rice breeder until his retirement in 2016. Dr. Christian DeGuzman is the current rice breeder. In 1997 the MRRMC became one of the founding members of the US Rice Producers Association. 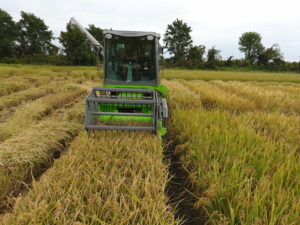 The USRPA is the only national rice producers organization comprised of producers, elected by producers and representing producers in all six rice-producing states. 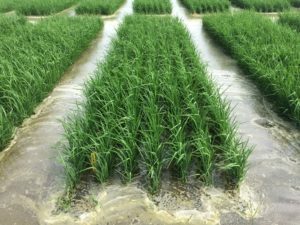 The uniqueness of the Missouri Rice Research Farm is that it is completely owned and operated by the MRRMC and it is our understanding that no other major research facility in the central USA is farmer owned and managed. Thus, all rice research is farmer supported, farmer directed, and farmer evaluated on farmer owned property. The University Missouri Fisher Delta Research Center and Southeast Missouri State University have been longtime research partners. The MRRMC supervises rice merchandising and branding. The council has initiated OPAA, a school lunch service provider enabling Missouri rice to become a key component of school lunch and breakfast programs across Missouri and five other states. The MRRMC works with the Missouri legislature to support September as rice month. The Council supports the growing of rice at the St. Louis Science Center (over one million annual visitors), and other marketing programs across the state. Members of the MRRMC are active in supporting trade missions to Cuba, and other nations in the Western Hemisphere. The MRRMC desires to thank all of the producers, agribusiness, academic researchers,, Federal-State agencies, past council members and citizen supports to realize the success of the Missouri rice sector.